Chandigarh :A directive has been issued by the Union Health Ministry to the Chandigarh Health Department to direct all private labs to put a cap of Rs. 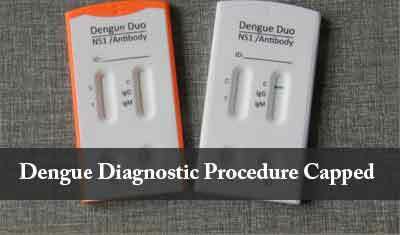 600 for all Dengue diagnosis procedures. The decision was taken at the behest of the Union Health Minister,Mr. JP Nadda, in New Delhi on 1st July. ‘The Health Department has received a communication to this effect,’ according to senior health officials. “We will follow the directions of the ministry,” said UT Health Director Dr Vanita Gupta. “The file to fix charges has been sent for approval and orders will be issued soon.”she added. “As you are aware, during the monsoon and post-monsoon period, the numbers of Dengue cases are on the rise and large numbers are reported. During this period, sometimes the community is in panic, due to lack of information about the government facility for free diagnosis or pressure on resources due to the sudden increase in cases… community moves to private health facilities where many times they end up putting up with high out-of-pocket expenditure for diagnosis and treatment,” read the letter sent by the Ministry. The Ministry’s communication further requested all concerned to ensure that its instruction was implemented and patients were not charged more that Rs. 600 per test in order to minimise hysteria in the community and also prevent them from being monetarily weighed down. Talking to the media, a senior health official made it clear that unlike last year, the department planned to conduct surprise checks at various labs, to check if the price cap was being followed.